This post originally appeared on Larry Nielsen's Today in Conservation blog and is reposted here with permission. On September 27, 1962, a highly-anticipated book hit the shelves. Reactions to it were immediate and strong. 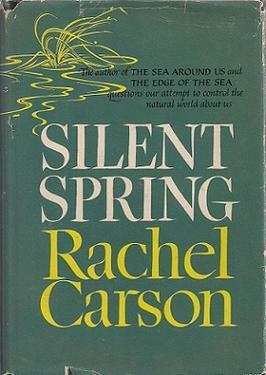 The author’s best friend called it “the poison book.” A spokesperson for the agricultural chemical industry called it “…gross distortions of the actual facts, completely unsupported by scientific, experimental evidence….” Supreme Court Justice William O. Douglas called it “…the most important chronicle of this century for the human race.” Today we call the book—Rachel Carson’s Silent Spring—the origin of the modern environmental movement. Rachel Carson was an unlikely writer for a book that caused such commotion. Carson, born in 1907 in rural Pennsylvania, was a shy, reclusive woman, never interested in the spotlight. Taught by her mother to observe nature and find her own lessons from those observations, she grew to love both science and literature. Forgoing the usual educational path for young women at the time—go to college, become a teacher or nurse, get married—she studied biology. Not just biology, but marine biology. Once she found her way to the Atlantic coast, she was never again far from the shore. Her third book, The Edge of the Sea, is the one that hooked me. As a teenage “nature nerd” growing up in Chicago, I was fascinated by her stories of the seashore and by the book’s drawings of strange and beautiful creatures. When I wrote Nature’s Allies—Eight Conservationists Who Changed Our World, I knew from the beginning that Rachel Carson would be one of the environmental leaders I profiled. She hooked me, just as she hooked an entire generation with Silent Spring. She didn’t want to write Silent Spring. She wanted to keep writing about the beauty and wonder of nature. But friends kept telling her about the deaths of wildlife after airplanes sprayed their fields and forests with insecticides. Unable to find anyone else who would take up the challenge, Carson dug in. She spent years gathering information about pesticides and their impacts, doing the painstaking research to connect the dots. Her conclusion: the wanton spraying of pesticides was poisoning the earth. She told the story in Silent Spring. First published as a series of articles in The New Yorker, it became an instant best-seller in book form. Although agricultural interests worked hard to discredit Carson, their efforts were drowned by the overwhelming positive response to the book and the caution that it urged. The Modern Environmental Movement had been born. Larry A. Nielsen is Professor of Natural Resources at North Carolina State University and author of Nature's Allies.